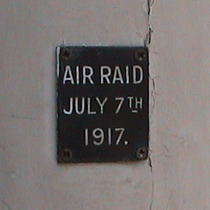 Air raid, July 7th, 1917. Very small plaque on the doorframe. 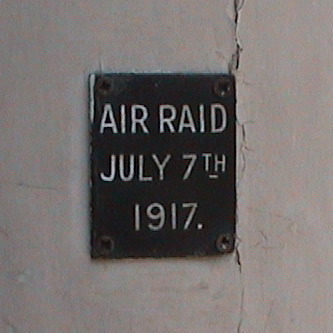 Wikipedia says: "A further Gotha raid of 22 aircraft was made on 7 July 1917, resulting in 54 deaths and 190 injuries. Many of these casualties were caused by falling anti-aircraft shells. One hundred sorties were flown against the formation, resulting in one Gotha shot down and three damaged. Two fighters were shot down by the Gothas." Gothas were heavy bomber aircraft. Vina Hutchinson provided this link to a 1919 newspaper article "lifting of censorship permits telling of story". English Heritage Ben Nicholson, O.M., 1894 - 1942, artist, lived and died here.